My relationship with RSVP Singapore did not just happen by chance. About four years ago, I met with an accident during a game of golf. I was thrown out of a buggy which hit a bump. I landed on my spine, breaking it. My screams could be heard from my friends who were playing two flights behind me. What happened after that was a blur to me and when I finally came round, an orthopaedic surgeon delivered bad news: I only had a 10 per cent chance of walking again. It was hardly comforting to be reminded to be thankful that I could move my bowels and urinate normally. Two months later I was transferred to Thye Hua Kwan Community Hospital. I had intensive physiotherapy, two times a day. The pain was excruciating and at times I felt like giving up. After all, chances of recovery were extremely slim. The dreaded physiotherapy sessions became easier as my friends, families and even strangers would come up to me to give their encouragement. I had put up a brave front to not let them down. Sometime during Chinese New Year 2012, I felt some sensation in my left toe. Eight months later I could make small steps. Like a baby, I learnt how to walk all over again! Everyone applauded my recovery. I discovered that some of the strangers were actually volunteers at the hospital. They encouraged and cheered me on during therapy. A friend introduced me to RSVP Singapore. I jumped at the opportunity – it was payback time. I signed up to help seniors like myself and enjoyed leading them in exercise classes. I want to thank the kindred spirits – the volunteers who opened my heart and eyes to a new life. A smile or a kind word of encouragement means a lot to someone in hardship. As long as you have a willing heart, you can heal! 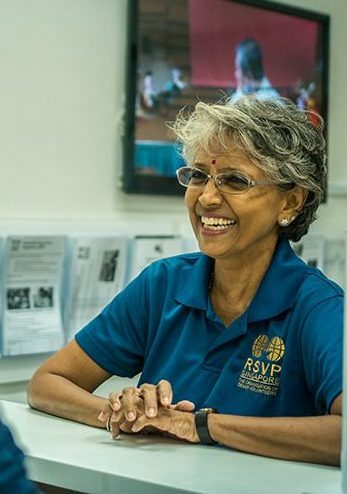 Photograph and excerpt from National Volunteer & Philanthropy Centre website.